Many singer/songwriters, guitarists and musicians have discovered the world of home studio recording. You want to record those great tunes you've written right? You have a band project going and you need a place to record your music work? You got the equipments, but you need to record that demo for the record companies? Well, building your own recording studio is a great place to start music career. It will take a little time. And research and some money you will need. 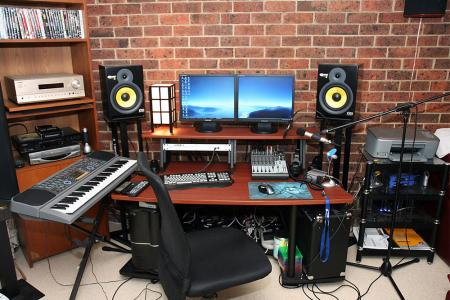 I'll save you some time and research and keep your money spending to a minimum by providing you with information throughout this site on how to build your Recording Studio. You know, I have built my recording studio and I'm still building it. Unless you are filthy rich, this is an ongoing process. Get the basics first and then add new gear when you can afford it. This post will mainly concentrate on how to build a computer based recording studio, but you will be able to find this site useful in many other recording aspects as well. You will find explanations on how to build high performance PCs suited for recording or choosing powerful desktop computers. I'll have guides on choosing many types of recording equipment like audio mixers, microphones, recording software, even studio furniture. Note that you don't need all the music equipment I talk about throughout this site to build a fully functional home recording studio. As I said, start with the basics and work your way up. If you want know about the main parts of Recording Studio, Click here .Let's go build a recording studio. Good Luck! You can always get your suplies from Zomo! !